On the night of New Year’s Eve, I sat in my apartment and felt, while watching Aliens, a mild but insistent anxiety about the passing of time, one which periodically poked through the dry-ice vapor and slime of the movie and forced me to pause and ask myself exactly what I was so anxious about, a question without satisfactory answers. Part of the anxiety is caused by the brackish nature of the new year, and all temporal border markings. The time that passes, or that which has passed, is a matter for mourning. The time that comes is a matter for celebration. New Year’s Eve is only un-depressing insofar as it looks forward to the time that will come. The sparkly eye-glasses and plastic goblets don’t bear the name of the year that has passed. Resolutions, too are largely temporary, falling away soon after being made. They are celebrations of the future, unchained from prior experience. Their articulation is more of a ritual reminder that change is possible, if only for that one moment in the year. Resolutions, and moments which celebrate or mourn the passing of time, are occasions for self-definition, or for modification of our definitions of ourselves. New Year’s Eve is a reminder that the self is neither entirely knowable nor often amenable to being known. 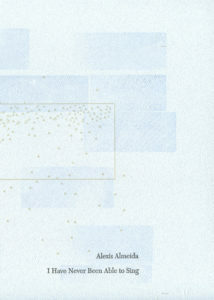 Alexis Almeida’s short (18 pages) chapbook shoots out precise statements, largely abrupt and simple independent clauses detailing the things she (or a narrator) has not or never will do, the things she does do, and attributes of her as a person. She is scared of being alone, prefers silence to small talk, has never held a gun. These are not, for the most part, large or sweeping statements. They are details, idiosyncratically catalogued. This exercise in self-apprehension seems a little gimmicky before reading, but produces a visceral appreciation when experienced in the text. There is a brief period while reading the book when it seems like a simple and possible project to corral the diffuse vapor of an identity into a box. This definability is comforting, indicating a stable and unchanging core. These details are the real substance of the narrative, and are, apparent even from these excerpts, complete and totally untrue, barely referring to an experienced reality. But this inaccuracy did not matter. The Greeks could only know who they were in relation to those around them, or in relation to those they were not. Because the women of the Kyrenians would not eat the flesh of a sheep, and the Greeks did, the Greeks became more Greek, more themselves. The truthfulness of these observations is immaterial; one must put a border somewhere in order to have two things be separate, but it does not much matter where. Usually this sense of identity and bordered-ness, for us, turns on a few landmarks in the very center of the continent of our selves. We are our profession; our favorite books; our political opinions; these are easy to state, but complex and deeply felt. In this text Almeida ventures away from the interior and takes a swing at the coasts, precisely mapping out what the mass looks like, showing us the points at which our selves end and others begin, and the places where the two intermingle. “I have the face of someone younger, people are often surprised by my age”; “I have never divorced, eloped, or ghosted”; “I have never ice-fished, though I would like to”. These statements are not aimed at the center-of-mass of the speaker’s self. Rather, they trace out the border, the places that are usually only commented on or noticed by others, and into which others may sometimes seep. On re-reading the text, which initially seems obsessively self-focused, it becomes apparent that not all of the statements concern the narrator alone. Some mention an unspecified other: “I have never thought of you while watching a pinwheel”; “I see your face in every willow, every rain”. There is some other person to which this litany of intimate details is addressed, a realization which changes the way that the details themselves can be read. They are no longer repeated by the narrator, one imagines, under her breath, to herself. They are communications. Just as the Greeks sought to separate themselves from their neighbors, these insertions separate the narrator from a dangerously porous other. Not all borders are coasts – some abut on other landmasses, other people. The narrator is able to simultaneously romanticize the other while outlining her self as a distinct and separate entity. These are linked but separate projects. All our relations with others involve continuous revision and definition of our selves. Others are always both threats and promises, occasionally flooding over the boundaries we’ve set to contain our selves, occasionally breaking them down altogether. This process is fluid and endless. Coastlines are reshaped by storms and hurricanes; maps from a century ago are not accurate today; we are aware that the Garamantians (whomever they might be) may choose to flee human company or embrace it. We come to know new people, forget others. If we are landmasses, we are mobile ones, or placed in a world wracked by some catastrophic tectonic mobility. Almeida acknowledges this chaos by the insertion of statements that hint at the narrator’s own gentle confusion within the project: “I can’t walk in and out of language”; “I assume the weight of objects”; “I am crossing the length of a city”; “I let my memories float around me”. This is not a permanent catalogue of self-hood, it is only a snapshot. At the conclusion of this litany of haves, have-nots and have-nevers, we are left with a better idea of what it means to be a self, a thing which is only partially apprehensible to the person occupying it. We are still confused, and a little anxious about the passage of time, but are comforted by the idea that this vast and vaporous self may be contained, if only temporarily, by some kind of verbal fencing. In the same way that the passage of time cannot be paused or deemed complete, the process of self-definition may not be completed — we do not really control who we become, or when that process stops. It can, however, be observed, and remarked upon, and this observation and remarking can result in some kind of brief understanding, one which will necessarily expire in time. Eamonn Gallagher is a writer living in Minneapolis, Minnesota.